Though you may not be as limber as you once were, there’s still hope that you can climb to the top of a tree. Well, sort of. Rising above the Ulster County landscape is a uniquely glazed home that was designed as a stairway to the top of its surrounding landscape. 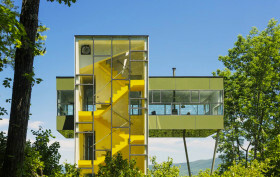 Created by New York-based architecture firm Gluck+, the contemporary Tower House works as both a viewing platform and a functional home, sitting atop a plateau on the 19-acre property. 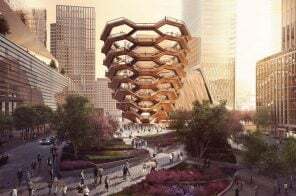 Its unusual, cantilevered shape causes minimal impact on the ground and provides inhabitants with amazing views of virtually the entire Catskill mountain range.